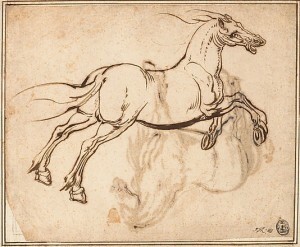 The hindlimbs have the kick and thrust to propel the horse forward. 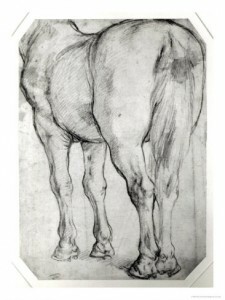 Much of the muscle bulk is up high in the rump (see my post from 9th May 2012, “More lovely horse anatomy”). 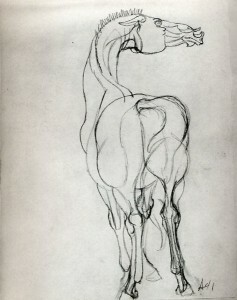 The lower parts of the hind legs are made up mostly of bone and tendon. 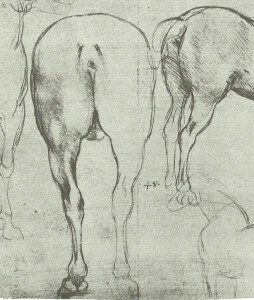 Right and left: Edgar Degas. 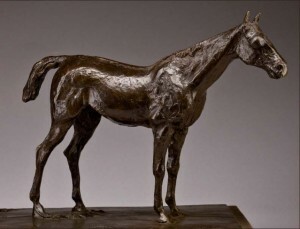 The original wax for this bronze cast was modelled around 1881-82. 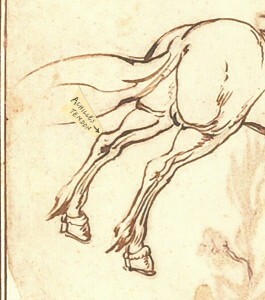 See how bent the leg is at the hock in the standing horse. At rest, the horse puts most of his weight on vertical front legs while the hindlimbs have more freedom to be placed further forward or back. 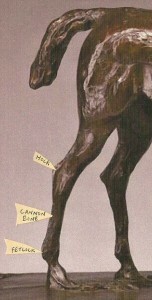 The cannon bone of the hindlimb is rarely vertical as seen from the side. Tendons around the hock joint appear as clear-cut structures with well-defined edges because they are under tension. 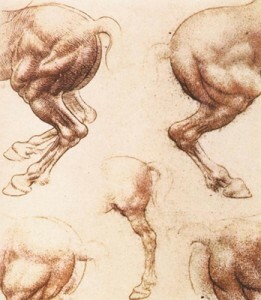 They form a wedge-like shape above the hock, and the different tones on the planes of this structure can be used to best advantage when drawing the horse. 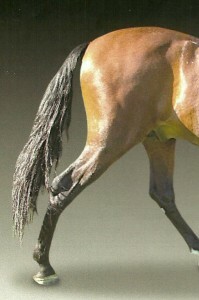 Above: Photo of horse’s hindquarters under strong directional lighting. Notice the interesting shapes of light and dark tone around the right hock joint. In the image below, muscles bulge as emphatic rounded forms. 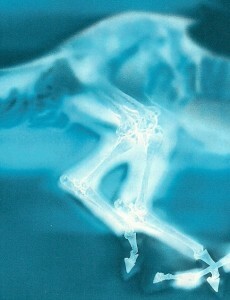 The effect is one of unsettling tension, with taut tendon lines running up the back of the legs to those tight muscles. Finally, here are two proud and prancing horses. 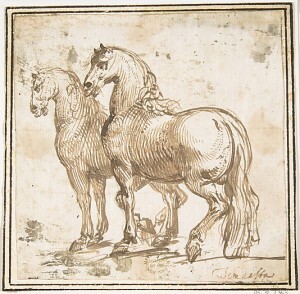 Though the handsome heads are the main focus of the picture, the contrast between the rounded rump of the near horse and the angular bent leg beneath it gives the image much of its energy. 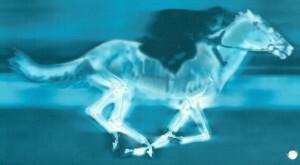 Try covering the rear end of the horse with a piece of paper, then look at what remains of the picture, and see how this takes the oomph out of the image.